We've got questions. And we're looking for the answers from YOU! 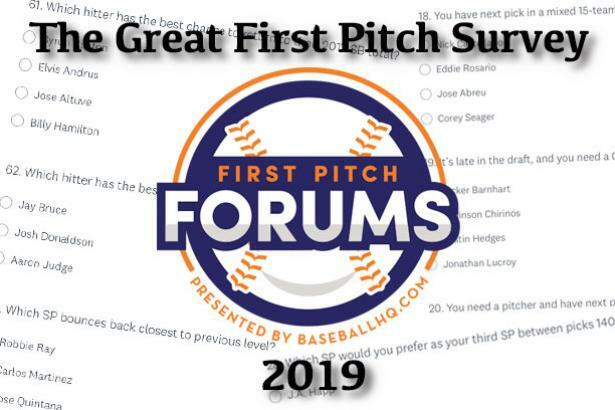 This year's First Pitch Forums spring tour is named The Great First Pitch Survey of 2019, and we're looking for your participation! It's a six-survey research project to "take the temperature" of fanasy baseball owners as we approach the 2019 season. The questions cover player evaluation, strategy, projections and more, and each 15-question survey should only take about 10 minutes to complete. The results will be compiled and form the basis of 2019’s First Pitch Forums program, a 3-hour, in-person draft preparation event that BHQ holds in five locations (Chicago, Atlanta, Boston, New York and DC/Baltimore) over the next six weeks. New this year is an online version which consists of 3 one-hour webinars during the Month of March. For all the details and registration information, visit our First Pitch Forums page. Through Wednesday, February 6, we'll add one completely new 15-question survey per day, and we'll have links to each on this page. Make your voice heard once, twice ... or even six times if you wish (though only fill out each survey once). And we're looking for as many respondents as we can get, so please share these links over social media in hopes of reaching far and wide. Thanks for your participation, and hope to see you at a Spring First Pitch event!